ChromeInfotech has established itself as a reputed node.js development Company that has been enriching Businesses with future-ready and high-performance node js empowered solutions. So if you are looking to Hire node js developer for your Project, then We are Here to help you. We have a dedicated team of node js developer that extends their development services to across 25+ industry segments. Our team at ChromeInfo Technologies has successfully delivered numerous node js empowered Solutions to both Small scale Start-ups as well as Big Scale enterprises. And We want to help emerging Entrepreneurs like you to Find and Hire dedicated NodeJS developers who can create the best Product out of your Project. So this is what this blog is going to be all about. In this blog, I have mentioned some of the crucial parameters that Characterize an excellent Node.js developer. So Whenever you decide to Hire node js developer , look out for these aspects. What is node.js used for & What does a node js developer do? How to Find & Hire dedicated NodeJS developers for your Project? What are the Benefits of Hiring node js developer ? What is the meaning of Full-Stack node js developer & Why hire one? So let us start with each of the above points! What is Node.js and What does a node js developer do? A node js developer is responsible for developing the server side logic and components of a Web Application. What makes Node js unique and Why should you hire node js developer ? In case you don’t, then I have discussed it in the later sections below. So you can read out that segment first and then come back up here or just continue reading below. If you are looking to hire node js developer , then you must keep in mind that he/she should satisfy all these aspects. Every one of Our node js developer team possesses all these essential and mandatory skills along with 3+ years of experience working with node js. So if you want to hire senior node.js developers, then ChromeInfotech is the right place to go to. View the full case study Here to know more about this Project. So, you’re looking to hire a Node.js developer for your Project? Associating With ChromeInfotech can be the best decision that you will take regarding a Technology Partner. As a leading Web Application Development Company, We aim at providing unparalleled and outstanding Node js development Services tailored according to every Project’s requirement. And We can achieve this through Our team of skillful and talented node js developer. No matter How Large Scaled Or highly Complex a Project is, Our node js developers have the potential to mold every idea into a one-of-a-kind Web-based Solution. Below are the aspects that characterize a node js developer as an expert and which make ChromeInfotech’s node js developer team the preferred Choice for every Business Venture. Well, this is one of the first aspects that you need to look out for when you hire node js developer . A specialist Node js developer is one who possesses a thorough knowledge about the architecture and functionalities of Node.js. There’s no point to hire node js developer who is not well aware regarding the aspects of node.js. Right? ChromeInfotech, being a leading node js development company houses some of the most experienced node js developers. Our team of node js developer is exceptionally proficient in using the various Versions of Node.js. They also keep themselves up-to-date with the Latest “Long term Support”(LTS) versions of Node.js (Current version of Node LTS: 10.15.3). Hence, Our node js developers are aware of the new features implemented in every updated version of Node.js. So We at ChromeInfotech can skillfully shape up your Web App with the latest available features and functionalities. With this, We ensure that all Our node.js based Projects are carried out efficiently. Yes, it is favorable if a node js developer to possess a basic knowledge of front-end technologies. But this is important, especially If you are looking to hire full-stack node js developer. A full stack developer is one who is proficient with both the server side and client side development of an Application(More about this later in this blog. So stay tuned!). Our dedicated full-stack Node.js developers build Web applications that are class-apart. And Front-end angular Web development is one such technology that We love to work with. Our developers strategically implement node.js with such other frameworks to build phenomenal Solutions for your Business. A Full-Stack node js developer should also be aware of the various Databases. This will facilitate smoother and faster development of your Web App. So Whatever your Project’s requirement is regarding a Database, We have the resources and the skills to fulfill them. There are numerous Frameworks present in the Market that works under the hood of Node.js. These Frameworks were created to expand the functionalities and features of Node.js. Hence, resulting in an improved and more excellent Web Application. These frameworks are suited for different types of Projects, depending on the requirements. Now In the very beginning, you may not have any definite answer to what your Project may require. So you may need to Hire node js developer who masters all the various Frameworks. With ChromeInfotech as your technology partner, you get to hire dedicated node.js developer who is a pro in all the various node js Frameworks. Our accomplished node js developers have the skills to make use of the appropriate Framework to meet all the requirements. Agile Software Development is an approach to Manage Projects related to software development efficiently. There are numerous benefits of adopting Agile into your Web App development Project. 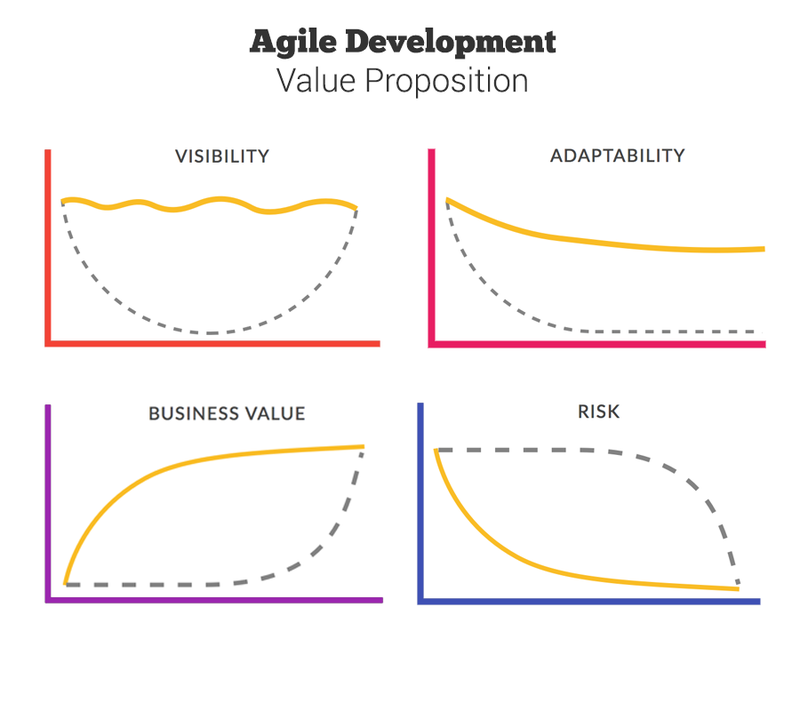 Check out this blog on Agile software development to know more about it! Now at chromeInfotech, Our team of node js developer adopts Agile into each one of their Projects. We ake sure that Our developers are well accustomed and trained to the Agile Approach of Software development. ChromeInfotech’s node js developers adopt agile to acquire a flexible approach to project delivery. Two of the primary Platforms that a node js developer must be experiences of working with are NPM and GitHub. NPM- Node Package Manager is the world’s largest software registry that provides node js developer with free tools to use while developing a Web App. While GitHub is used for version control by developers. And you must hire node js developer who possesses mastery over both the platforms. ChromeInfotech’s team of node js developer holds years of experience working with these two platforms. Our developers make use of these repositories to assemble codes according to Project requirements. This is one of the reasons Why every node js Project of ChromeInfotech turns out to be more Productive and Time-efficient. Errors are something inevitable during the development of a Web App. So a Node js developer is bound to encounter situations that would require him/her to handle an error. But the critical part is How an error is handled. A proper approach towards handling an error is much more important than it seems to be. With such expertise in handling errors, your Web App will surely turn out to be bug-free! A node js developer with the right set of Soft skills can Steer your Development Project in the right direction in a proper manner. Our highly skilled team of node js developer encompasses all the soft skills required to carry Out your Project adequately. This is Important for proper coordination among the team members. You must hire node js developer who can communicate and understand the Project requirements effectively. Your Project is bound to face issues at some point or the other. And in that case, you would need a node js developer who correctly approaches such issues. Taking the right action at the right time can help to save up a lot of your time and money. These are the skills and competencies which every Node js developer must possess to be acknowledged as an expert. And that’s what Our node js developers are! They possess all the qualities that a specialist and skilled node js developer should encompass. ChromeInfotech provides the best Node JS Development Services and can be the perfect technology Partner for your Node.js based Web Development Project. ChromeInfotech can be the perfect technology Partner for your Node.js based Web Development Project. Now there’s another important deciding factor to Hire node js developer . This can be confusing because a lot of factors are responsible for this decision. The debate regarding hiring a node js developer from a professional firm vs. hiring a freelancing developer has no end. But We at ChromeInfotech believe that a professional firm would any day win the battle here. Scroll down below to know Why We Think So! Our team of dedicated node js developer takes care of every aspect of your Project under one roof. Starting from MVP Development of your Web App to providing post-launch support and maintenance, We take care of every single aspect. At ChromeInfotech, We deliver precisely what you Require. We focus on the timely delivery of your Web-based Solution without Compromising on its quality And provide exceptional Node js development Services that are class-apart. But a Freelancing node js developer cannot cater to all the above aspects together. This is mainly due to a limited skill set, limited resources and so on. An Entrepreneur like yourself can put your trust a professional firm like ChromeInfotech with your unique App based Business ideas. We sign an NDA with each of Our Clients to restrict the accessibility of sensitive Business related information to any third party. Also, once you associate with Us, We provide Our full commitment to your Project. At ChromeInfotech, you can hire dedicated node js developer who will be there consistently with every step of the Project. With Us, you build a rusted and long-lasting relationship that extends beyond the Web App Development Project. In contrast, With freelancers, you are bound to face confidentiality and trust issues. You cannot count on them entirely as freelancing node js developer can disappear. One minute they are there working with you and the next minute they are gone. As a leading software development Company, We have experience working with projects belonging to 25+ industry segments. So no matter what your Business idea or requirements are, Our node js developer will surely be able to comprehend them efficiently. In the other hand, a freelancer lacks exposure to such a vast ecosystem. Also, they do what you pay for. They won’t take extra efforts to sit down and understand your Business Vision. Coming up with new creative ideas is the key to the successful development of your Web. At ChromeInfotech, We house a team of talented node js developer. We focus on Teamwork because it what sparks innovation. Moreover, We also remain updated with new trends and technologies. We adopt new innovative technologies into Our projects to build state-of-the-art Applications. Whereas, a freelancing node js developer lacks the availability of a full-fledged team. Also, they put in only a limited amount of time to your Project. Hence, lacking innovations. At ChromeInfotech, We understand the importance of always keeping in touch with Our Clients. We have a team specifically dedicated to undergo communication with Our Clients. We respond to Our Clients queries or issues at the earliest. But a freelancing node js developer has a flexible schedule. So might not be at times to respond to your requirements. So as you can see, ChromeInfotech takes the medal against a freelancing node js developer. The only aspect that may be beneficial if you hire node js developer who is a freelancer is- The cost factor. Looking at the short term, hiring a freelancer will cost you less. But from a long-term perspective, it won’t be as beneficial a sit seems. That’s because a professional software company like Us can guarantee you a product that is quality oriented. But The same cannot be said about a freelancer. Revamping your App afterward would cost you more money and time! So it is of your best interest to make your decision wisely and hire a node js developer from a professional firm like ChromeInfotech. Why should you Hire Node js developer ? Now if you are not sure about whether you want to hire node js developer . Then this segment of the Blog is for you! I understand that as an Entrepreneur, you must carefully look into what’s the pros and cons before taking a decision for your Web App based Business Project. So We at ChromeInfotech want to assure you that Node.js is an excellent choice for any Business venture. Over the years, Node js has gained immense popularity. 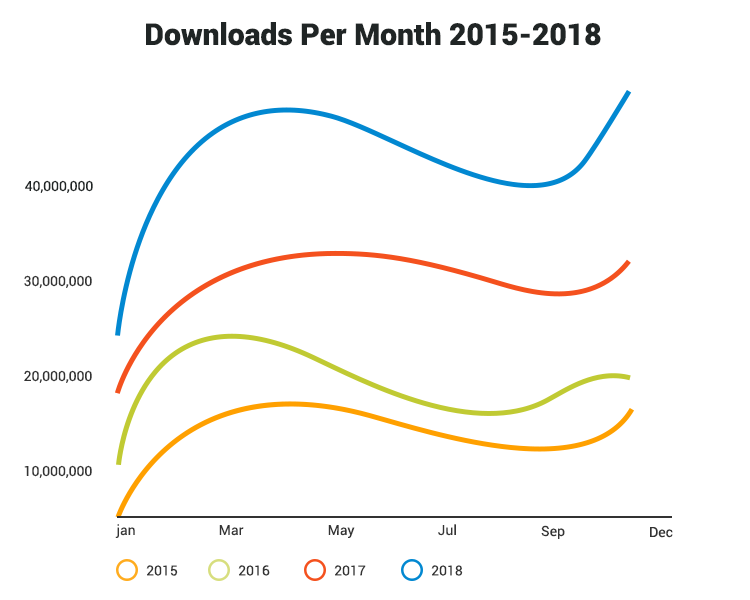 The usage of Node.js is increasing with every year. And as of today, it is one of the most popular and in-demand server-side technology. Here’s a brief overview of the reasons Why you should Find & Hire dedicated NodeJS developers for your Project. Node.js grants a Node js developer the ability to create Powerful, Scalable and High-performance Applications even out of a Low Budget or Small Scale Project. Every Node js based Project of Ours resulted in a Success and a Happy, Satisfied Business Owner. By using Node js, Our team of node js developer was able to carry forward the development process efficiently. And hence, resulting in increased Productivity and a more excellent and upgraded Web-based Product. This is one of the top reasons Why We recommend you to Hire node js developer . 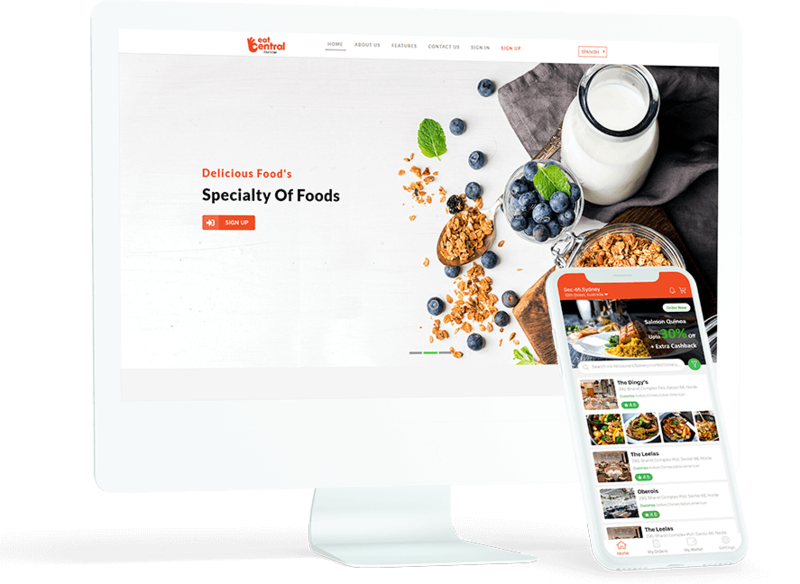 Also, We have a team of highly experienced and proficient web app developer for hire who holds expertise in node.js development. So if you have made up your mind to hire dedicated node.js developer for your Project, then do drop by in ChromeInfotech. 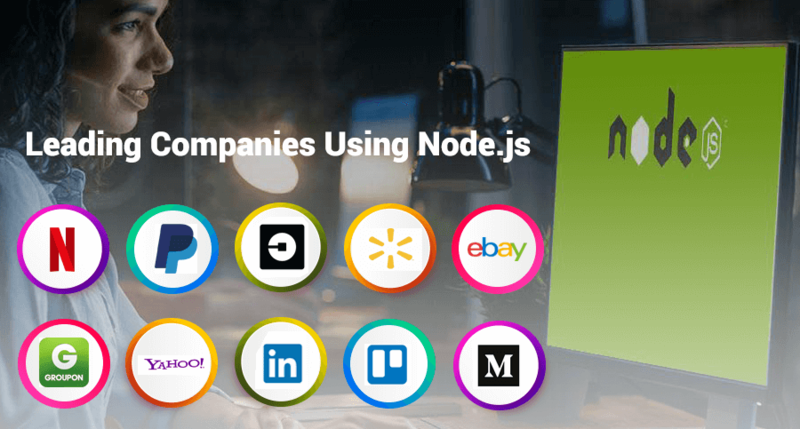 Node js is used by some of the leading Companies in the Global Market. 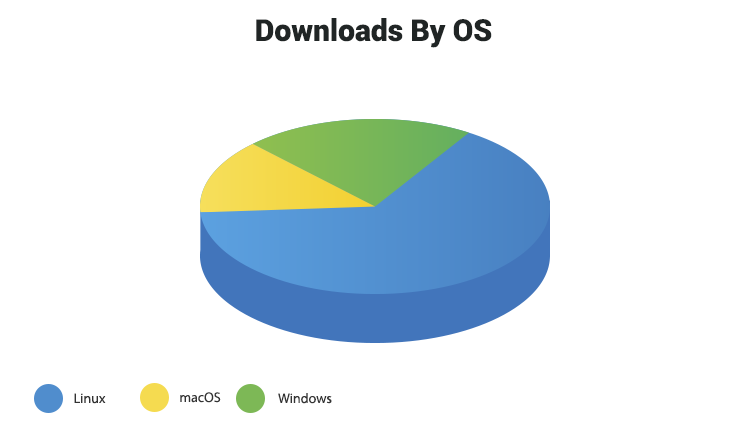 Almost 98% of the fortune 500 companies are regularly using Node.s to leverage their Businesses. And it’s not just Enterprise level Companies that are Hiring node js developer. Even emerging Start-ups are considerably leveraging node js for enriching their Businesses. You can rest assured that deciding to Hire node js developer will be of the best interest for your Web app based business project. It is apparent that you would want your Web Application to be fast and high-performing. And you can achieve that by choosing to Hire node js developer . Node.js empowered Applications are by default very powerful as in case of performance. One-Node.js runs on Google’s V8 engine. Two-The asynchronous and non-blocking I/O model of Node.js. These two aspects of Node.js allows the creation of a fast and high-performance solution- Another reason for you to Hire node js developer . Node.js based Applications are capable of handling multiple requests concurrently. Hence, making it an easily Scalable Application. If you are planning to grow your Business in the future, then the best option is to Hire node js developer . A node js developer will be able to deliver a robust Web-based Solution that can handle a growing user base efficiently. Node.js is the ideal technology if you wish for a Modern Web application. Modern Web applications are characterized mostly as Single Page Applications and Real-time Applications. If you want to keep yourself updated to the current trends and standards, then you should undoubtedly hire node js developer for your project. Node js has brought in a new approach to Web App development. Yes, a Node js developer can deliver your Product in less time and within a less Budget. But the issue is that you can avail these benefits only by hiring a full stack node js developer. Continue reading below to know What do I mean by Full Stack node js developer and Why should you Hire them? Full-Stack node js developer and Why should You hire one? Being a full Stack web application development Company, We at ChromeInfotech believe that hiring a full-stack Node js developer will significantly benefit your Business. They can be your one-stop solution to build a complete Web App. So How is a full-stack node js developer different from a regular node js developer? Well, A typical node.js developer has proficiency only in node.js and the server-side development of a Web App. These developers don’t possess front-end development skills and are not well versed with other framework or technology. Whereas, a full stack node js developer is one who along with node js and server-side development is also skilled in front-end development technologies. It means that they are competent in every phase of the development process. A full-stack node js developer can take care of the complete development process, right from the tip to the tail. You don’t need to go about hiring different sets of developers who specialize with the other phases of development. That means you need to hire only one set of developers to get your job done. And hence save up your funds. There won’t be any inconveniences that are generally caused due to a lack of proper coordination among different teams. This will result in a more efficient and smooth development Process. Also, synchronization becomes much more comfortable with a single developer since there’s no dependency on work. It’s up to the developer How or When he/she wants to go forward a particular task. And this saves up a lot of extra effort and time. Then a full-stack node js developer is the perfect fit for you. At ChromeInfotech, Our dedicated full-stack Node.js developers build Web applications that are tailored to every needs and requirement of your Project. They specialize in a multitude of tools and technologies which they put to use along with node js to develop the perfect Solution for your Business. So after getting to know about all the benefits of Node.js are you ready to Hire node js developer for your Project? And If you primarily want to hire senior Node.js developers who are experts, then ChromeInfotech can be the best-fit technology partner for you. Node js is quickly becoming one of the most loved server-side technology of Entrepreneurs. The benefits of using Node.js for your Web App based Project are many. But confusion and problems arise when it’s time to Hire node js developer . Choosing the right Technology Partner for building your Web App is one of the most crucial Business related decisions that you have to take. You need to find and hire dedicated NodeJS developers whom you can put your trust on to understand and value your Business idea and requirements. At ChromeInfotech, Or team of Node js developer highly regard your ideas and vision. We build customized node.js empowered Web Solutions that are tailored specifically for you and your Business. Our priority is to take into account all your needs and requirements and shape the whole Project around it. We do this to create a software product that is exclusive to your business and to help establish the presence of your business Brand in the Global market. You can count on Our experienced and senior node js developer to hand you over the best possible Web App Solution out of your Project. Then please go ahead and fill in your requirements in the form on your right. Our team will get back to you at the earliest. Also, We would love to get your feedback on this blog. So please do drop in your comments in the comment section below.